I’m always a little surprised when my free issue of Architectural Record arrives, seeing as I haven’t subscribed to it since I stopped getting it with my AIA membership a few years ago. The final issue of 2015 arrived recently and I flipped through the a short guide to new publications (Monographs in Disguise) penned by New York-based architect Alexander Gorlin. In it, he takes a swipe at the idea of a monograph, calling it a “a ‘must have’ accessory for every ambitious practitioner and a valuable marketing tool.” He goes on to describe “the camouflaged monograph,” which in Gorlin’s eyes is a monograph with a “theoretical premise” that exists as a way for publishers to sell more copies. It’s hard for me to believe that anyone thinks that making a monograph more topical and theoretical is some kind of clever slight of hand that will trick the book-buying public into buying more of them. But would a monograph with a theoretical premise really be such a new thing? What is the difference between the two categories in the first place? This is a topic that architect and professor Richard Fernau dealt with for many years in a seminar at UC Berkeley titled Monographs and Manifestoes where students read and discussed key architectural works from the early 20th century forward. The class was about the limits of theory as much as it was about how to write about architecture. Fernau’s own new book Improvisations on the Land: Houses of Fernau + Hartman was part of Gorlin’s monographs list, and his take on it was less than positive. The review closes with the line “the baroque efflorescence of sheds and gables devolves into a cartoon of a farmyard, and the later high-budget projects suffer from a self-awareness that muffles the exuberant invention of the earlier buildings” while also referring to the F+H work as “playful riffs” on the vernacular via Hejduk, Gehry and Moore. Rather than looking towards the work of Gehry and Hejduk, it makes more sense to look at the history of the Bay Area and Northern California (but when has a New Yorker ever done that?). Charles Moore is solidly a part of the Third Bay Tradition, which included his firm M/L/T/W and Joseph Esherick’s firm EHDD (more the the Third Bay Tradition here). The Third Bay Tradition built on foundation laid by Second Bay Tradition architects like William Wurster, and infused it with greater informality. The Third Bay Tradition had nearly run its course by the time Fernau + Hartman were starting to build in the early 1980s, and their work picks up where it left off while also taking on the eclecticism and contextualism of Postmodernism. Importantly, the work is always deeply related to its site and this is a theme that is reflected in the title of the monograph and in the text. The word “improvisation” comes up again and again, and with good reason. There are no predefined solutions, and in many cases individual projects came together over a long period time as the architects got to know both the clients and the site. Fernau and Hartman’s satellite office (known as the “Bucket of Blood”) in small town Montana makes it in the book and is one of the stronger examples of their improvisational style, even though it doesn’t quite fit in with the larger rural residential projects that dominate the volume. It does what the writing says it should be doing: it is a bit rough around the edges, works remarkably well in its location on a small-town retail strip, and is sustainable in a number of ways, including reusing demolition materials to build out the interior. It’s a Montana building done with a California sensibility on a reasonable budget. A collection of short essays by Daniel P. Gregory, Beth Dunlop and others help to set the context for the built work. The bulk of the content is studies of individual projects spanning from the mid-1980s to the present. The earlier houses are simpler and more eccentric, while the later homes near the end of the book are more polished and expensive but all show the same determined focus on connecting the buildings with their occupants and their sites. The line between a Monograph (often thought of as a glossy coffee table picture book) and a Manifesto (something ranty, possibly photocopied and hand-stapled and distributed on street corners) is often blurred in the architectural world. Fernau + Hartman haven’t set out a grand theory on how architecture must be done. That’s Patrik Schumacher’s territory. 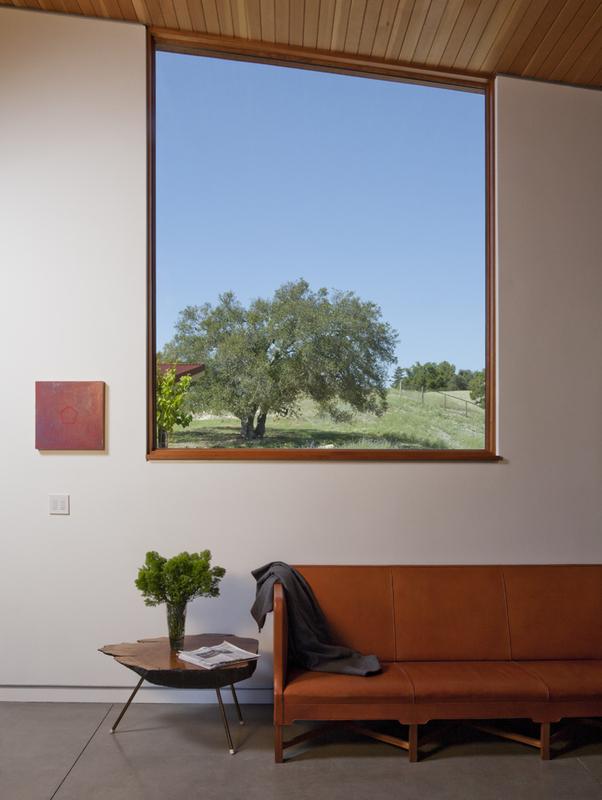 Nor have they simply compiled a collection of pretty photos, rather it is a collection of stories and the story of a how a firm thoughtfully evolved not only their own work but the project of California modernism over several decades’ time. The buildings are imbued with the philosophy of the authors, but are not rigidly defined by it. In the end, if you’re interested in West Coast Architecture and understanding one of the key California firms that has been working here day in and out for the past three-plus decades, pick up a copy. If I had to suggest there is an omission, it would be Richard’s first built project, a postmodern hot dog shop I believe was called “Franks for the Memories.” I guess they can save that one for the next book. There aren’t so very many things in the world of design that engage the general public to think about space in a creative and engaged way. Architecture has to work, but it also has to make us dream. I couldn’t agree more, and I certainly don’t have a problem if someone wants to go out into the world and build his or her own home out of containers (or office or business). As I mentioned in the first post, there are instances where it might make a lot of sense to build something this way, and there may be cases where someone wants to spend a bit extra to get the shipping container aesthetic. There’s nothing wrong with that. You’re not going to be building a $5,000 home, but you might get something unique that doesn’t look like your neighbor’s place and you might have fun doing it. When we can reach you by road in Europe, modular units of 3 meter wide and up to 14 meter long may fit your needs better. These modules are not bound by strict transatlantic shipping standards and can be tailored exactly to your needs, as long as they fit on a truck. The other issue is that speculative architecture should be interesting, thought-provoking, and not necessarily buildable. I get that part. It should make people ask questions, and probe issues without having to answer to the realities of architectural practice. However, shipping containers have been a recurring theme for several decades now, and it’s not exactly a ground-breaking idea. Lot Ek has done some very interesting work for a long time, as have others. The Plug-in City as a total project was the combination of a series of ideas that were worked upon between 1962 and 1964. The Metal Cabin Housing was a prototype in the sense that it placed removable house elements into a ‘megastructure’ of concrete. The discussions of Archigram 2 and 3 built up a pressure of argument in favour of expendable buildings: and it was then inevitable that we should investigate what happens if the whole urban environment can be programmed and structured for change. These projects went on to inspire other architects, and continue to until this day. It was a years long creative project that tied into an entire body of speculative work, and was investigated in a variety of media, but Archigram didn’t spend a lot of time telling people how practical their idea was, or how it was going to save the world. Places Journal has a fantastic piece about the emergence of container urbanism that ties the 1960s to the present and investigates the differences between the two eras. Yes, you can build things out of shipping containers. It may save you 15% off your construction costs (or it may cost a lot more in some cases), it has trade-offs and some benefits, and no, it’s not always eco-friendly (it’s actually down-cycling a lot of valuable steel). It can be a good way to build a movable temporary building. Most importantly, I don’t actually want to tear down container buildings despite what the CBC might have you believe. What’s wrong with shipping container housing? Everything. What’s wrong with shipping container buildings? Nothing, if they’re used for the right purpose. For a temporary facility, where an owner desires the shipping container aesthetic, they can be a good fit (look, I’ve even done a container project!). For sites where on-site construction is not feasible or desirable, fitting a container out in the factory can be a sensible option, even though you’ll still have to do things like pour foundations on site. It probably won’t save you any money over conventional construction (and very well might cost more), but it can solve some other problems. The place where containers really don’t make any sense is housing. I know you’ve seen all the proposals, often done with an humanitarian angle (building slum housing, housing for refugees etc) that promise a factory-built “solution” to the housing “problem” but often positioned as a luxury product as well. This post on ArchDaily got me started on a Twitter rant about the unsuitability of containers for these projects, and the larger trend of online design publications not bothering to ask any questions and run these press releases as “news”. Not to mention the architects themselves presenting this idea as a feasible solution to a major problem. Housing is usually not a technology problem. All parts of the world have vernacular housing, and it usually works quite well for the local climate. There are certainly places with material shortages, or situations where factory built housing might be appropriate- especially when an area is recovering from a disaster. In this case prefab buildings would make sense- but doing them in containers does not. If you are going through the trouble of building in factory, why not build to a dimension that is appropriate for human habitation? With only 7’ clear (2.1 m) inside a built-out container, you are left with the building code minimum room width as your typical condition. It’s hardly an ideal width, and it is not difficult to ship wider modular units: modular home builders do it all the time. Insulation. All surfaces of the container need to be insulated, and this means either building a new set of walls on the inside or outside of the container. If walls are furred out on the interior, this is convenient for plumbing and electrical lines but it narrows the usable space of an already small box. It also allows for a huge amount of thermal bridging unless the floor is built up with insulation on the inside (which brings up a host of other problems). If the exterior is insulated it no longer looks like a container, and then you have to pay to clad the entire thing over the insulation. In either scenario you’re duplicating all of the walls that you started with. Improper insulation will result in heavy condensation on the inside of the metal exterior walls. Stacking. 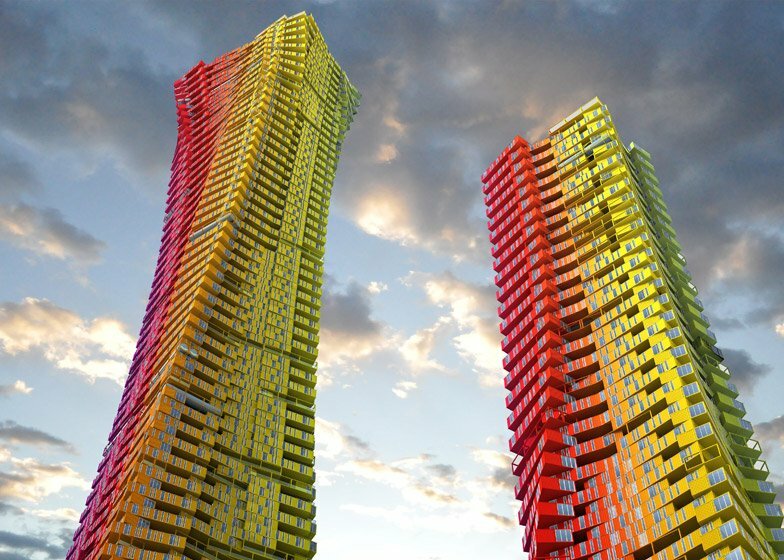 One recent competition boasted that because containers can be stacked 9-high, concrete floors could be provided every 9th floor with stacks of containers in between. That load still needs to travel down through the building, and still then requires columns. Those floors every ninth floor need to hold the entire weight of 9-stories of building above, which makes it dubious that you’d really be saving much on structure. The foundation also needs to be built similarly to a “regular” site-built building, and this is one of the most expensive pieces. 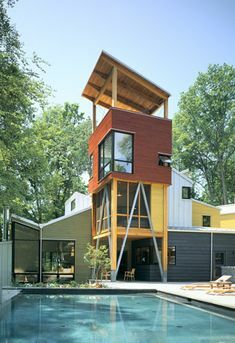 Stacking also requires a large crane and an area for staging the prefabricated container modules, which can be hard to arrange on a dense urban infill site. Utilities and Mechanical Systems. In a large building, you’ll still need a lot of space to run utilities. Because of the problems with insulation mentioned above, you will need to install a very robust HVAC system to heat and cool the building (that Mumbai tower shown above would literally be a deathtrap without cooling). You will have a hard time taking advantage of passive strategies like thermal mass if you maintain the container aesthetic. You’ll also end up with low ceilings, as even high cube containers are only 9-’6” (2.9 m) in overall exterior height, so any ductwork or utilities start cutting in to headroom. Recycling. Part of the container narrative is that it’s “green” because we have a surplus of containers that can be reused. This is somewhat true, but in reality many existing container projects use brand new containers from China (which are still very cheap to buy). Used containers need to be thoroughly cleaned because there is a risk they may have been used to transport something toxic in the past. What you get with a container is cheap structure, if you can use the box-basically as-is. As soon as you remove anything (including the ends) you need to hire welders and buy steel. Architecture is more than structure though and structure on its own is not particularly expensive- especially when you are building a space as small as a shipping container, so the savings here are minimal. Relatively untrained people can build a room that size of simple wood framing in a day without needing to rent a crane or learning how to weld for about the same cost (or less) than buying a used container. Posted on September 1, 2015 September 2, 2015 Categories Architecture, housing, ranting2 Comments on What’s wrong with shipping container housing? Everything. Are San Francisco’s “famed progressive politics” really to blame for the housing crisis? Perhaps you have read Gabe Metcalf’s piece for CityLab titled ‘What’s the Matter With San Francisco? The city’s devastating affordability crisis has an unlikely villain—its famed progressive politics.’ It goes into depth about how policies in San Francisco have lead to the current situation where one bedroom apartments are renting for $82,000 per year. Yes, policies in San Francisco and the surrounding area have lead to very high housing prices. Who is to blame? I have a hard time blaming Progressives (whatever that means these days). Chris Daly (arguably one of the most “Progressive” politicians San Francisco has had in recent years) helped pave the way for the massive number of new units in SOMA by brokering a community impact deal in 2005, and these units are the majority of the housing that has been created in the last 10 years. The Eastern Neighborhoods Plan, which upzoned large areas on the east side of the City, was approved by a Progressive-majority Board of Supervisors. It should also be noted that most of the areas that have been upzoned are less wealthy and more dominated by renters than the areas that are primarily single family. The line that keeps getting repeated that we should have been building 5,000 units a year is absurd taking into account the realities of development. The math makes sense in the simplest way possible, but we all know that no developer is going to build those units at the bottom of a recession (and the economy is always cyclical), and nobody 25 years ago would have predicted the level of in-migration and income inequality we have right now- even taking the population boom that started in 1980 into account. Far more units than that have been permitted in each boom and in most cases developers have declined to build them (or deferred them until the next cycle). The fact that they haven’t been built has more to do with economics than obstructionism. I’m not saying that everything in this piece is wrong- it’s clearly not – but blaming Progressives for our current situation is misdirected. There need to be regional changes to allow additional housing all over the Bay Area if we are ever going to have a serious impact on affordability. There needs to be a change similar to what is being studied in Seattle to re-think single family zoning, and this can’t happen in San Francisco alone. Unless you’re already a property owner, things are not getting any easier in San Francisco. Rents rose nearly 14.9 percent from January 2014 to January 2015. San Francisco permitted just 193 new units for every 1,000 new residents from 2012 to 2013, according to Zillow. 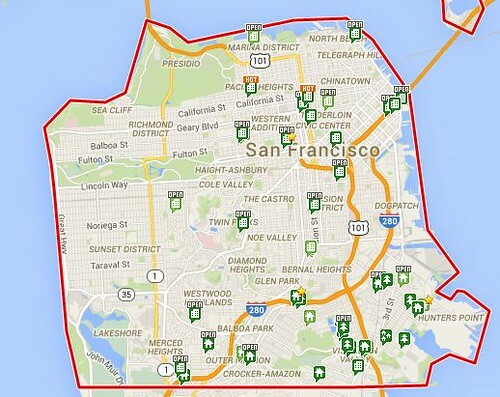 San Francisco: Not affordable, not many permits. There are pieds-à-terre in both new and old buildings. New buildings do not create demand for pieds-à-terre. Recent legislation to limit short-term rentals to units that are someone’s primary residence is going to be important. Their main conclusion? “San Francisco will need to do a better job collecting this data in the future.” It’s hard to craft policy when the data required is so difficult to collect. This is very important. I would also encourage SPUR and others to look at the effect that platforms have on apartment sharing. Room rentals in shared apartments (historically via newspaper ads, and then Craigslist) make the the biggest pool of affordable housing stock in San Francisco and there is reason to believe Airbnb is having an increasingly large effect on this housing pool. The Chronicle’s research showed that there were about 5,000 rentals available on a given night on Airbnb alone. That all being said, this is still not an enormous part of the housing market, and with so much new housing being built as rental apartments there isn’t even the opportunity for foreign investors to buy them and leave them vacant. Okay, so if those aren’t the MAIN reasons why it is so expensive to live here, what on Earth else could it be? A more staggering statistic: the number of employed people has increased by 25% in just five years. The city has grown by over 100,000 people in just 20 years, and the rate of growth has jumped dramatically since the end of the recession. It’s as if (almost) everyone from Berkeley moved to San Francisco but we didn’t build anywhere to put them. As indicated in the data at the beginning, housing construction has not kept up. The roughly 10,000 units being kept off the market that were noted in the SPUR study don’t even come close to having the effect of having 45,000 people move here in the last few years, especially when only a few thousand (less than 2,000 net in 2013 for example) units are being built. You can call me a supply-sider if you’d like, but it is pretty obvious that we don’t have enough places for people to live. If there is a beer shortage and it’s really hot outside, people with money are going to be willing to pay A LOT more for the last few cans of Coors. What types of solutions are being looked at now? and $20 million to expand the downpayment assistance program for teachers and other first-time homebuyers. Wait, I thought there was a shortage of housing… don’t we need more? That’s not what District 9 Supervisor David Campos thinks (read Bernalwood’s coverage here). Despite the fact that very little market rate housing has been built in the Mission, Campos thinks that putting a Moratorium on new development is somehow going to stop gentrification and evictions. All of those people we hear about getting evicted in the Mission (and believe me, it is a problem) are not living in new buildings. They are living in old buildings, which is where new residents end up living because we’re not building anywhere else to put them. We can’t stop people from moving to San Francisco, as much as some people would like to, and we can’t stop centrally-located neighborhoods with tons of amenities (like the Mission) from being attractive to newcomers. Especially rich newcomers who can live wherever they’d like to. What we can do, as a city, is not support policy ideas that do nothing to address a critical shortage of housing affordable to people who already live here while increasing the pressure on the existing housing stock (where people already live) to accommodate a population boom. Maybe a market rate development at 16th & Mission would be more palatable if the developer paid to get two nearby affordable buildings built? Open up the entire city to accessory dwelling units, not just Supervisor Weiner’s district where there is a trial program. These units are more affordable by design and can be built much more quickly than market rate projects. Accelerate the development of housing, at a very high level of affordability, on city-owned sites. The city has a program to develop city-owned parcels but the timelines are slow. The Balboa Reservoir is one such site and they are still going to be in the “community planning workshops” phase two years from now. This is a crisis decades in the making, we need to figure out how to get things done faster. Upzone transit corridors in outlying neighborhoods where land is cheaper and smaller sites are more attractive to smaller developers. The Sunset District Blueprint looked at this, but only recommended a 5% increase (1,300 units) in housing stock. Allowing a lot more housing in a lot more locations is the only thing that will, over the long term, add enough stock to make a difference in affordability and of the new housing in the city can’t go in a handful of neighborhoods on the east side. Mandate information collection from Airbnb and other vacation rental services, and make it easier for hosts to register with the city. The Planning Department should know how many people are using the service, and what impact it has on the housing market. There are a number of pending legislative issues now. Use existing city funds to move stalled affordable housing projects forward, or direct affordable housing fees from new affordable projects to stalled projects in the same neighborhood. Things are finally moving now on some of these parcels, but why not partner up market-rate developers with the non-profits and find creative ways to get more affordable projects out of the ground as quickly as possible? Mission Local wrote a great piece about stalled affordable projects last year. There are a lot of other projects around the city (not just the Mission) that have affordable housing planned but there isn’t quite enough money to start construction. Moratoriums and calls for every project to be 100% affordable are not going to solve our current slate of problems, and in all honesty I am not sure anything will in light of global economic forces that are all coming to a head in the Bay Area. However, there are some things we should try and we need leaders who are willing to support them. A lot of these housing issues are going to end up on the ballot this year, Randy Shaw takes a look at two of these measures here. San Francisco has risen to huge challenges in the past. The city recovered in a few years from being burned to ground, and managed to house a huge wartime population boom in the 1940s. We need to do anything and everything to solve the housing crisis. San Francisco rebuilt from the ’06 earthquake faster than we can install a bus turning lane today. Ed Lee touted San Francisco’s down payment assistance program in his State of the City address this week. 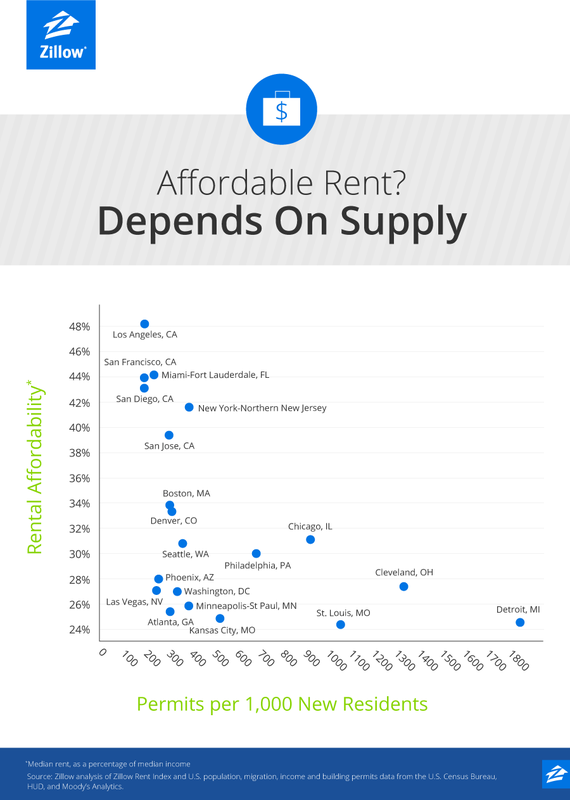 How well does it really work in an incredibly expensive real estate market like San Francisco? Assume a couple with no kids is making 120% of the median income, which is the maximum you can make to take advantage of this program. That is $93,250 for two people. Monthly that works out to $7,771 per month. Let’s go over to bankrate.com and see what they can afford to buy. Let’s assume they can max out the down payment assistance at $200,000 and plug that in as the down payment. I assumed no other debts. This is pretty unlikely as most people have a car payment, credit card bill or a student a loan (or all three). I made assumptions about rates (4%), taxes ($7,000/yr) and homeowners insurance ($1200/yr) that may or not be perfect but are close enough. You can buy a $ 642,773.13 home (in this very simplified calculation). How many properties are there in this category? Redfin shows 49. Many are either TICs studio units (good luck getting your financing to work out on that if you are trying to get financial assistance from the city) or vacant land. There are admittedly a few actual homes for that price, but it’s slim pickings. What are the other catches to this program? You must be a first time home buyer. There is a minimum of 1 person for bedroom, so if I couple can only find a 3 bedroom house that meets their criteria they are out of luck. The buyer must have three months of reserve funds after purchasing. There are also other problems- it is very difficult to get a mortgage on a property that is considered a “fixer” in San Francisco (which many of the properties in this price range are) and your offer will not be very competitive on a property with multiple bids. That other couple that isn’t getting down payment assistance will most likely be able to offer more money. This doesn’t seem like a realistic solution to help solve a housing crisis in its current state, but perhaps part of the program to offer more funding could also change the terms? Leaving San Francisco. What’s your backup plan? Last December, SF Mayor Ed Lee announced a Mayoral Executive Directive ordering all city departments with jurisdiction over housing permitting to prioritize housing construction, particularly for affordable housing, and his state of the city address in January called for 30,000 units of new housing by 2020 with 1/3 of them built as permanently affordable. Come hear about the effort and the new policies that have been put into place. I know you have questions, so please stay until the end when the panel will take inquiries from the audience. Take This Hammer from SF Bayview on Vimeo. 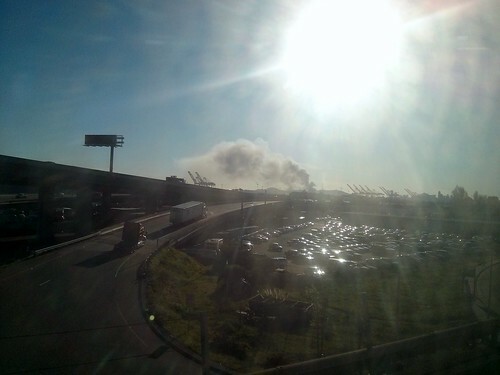 The Mission Bay construction site fire on March 11, 2014 as seen from a BART train in West Oakland (photo by author). Yesterday’s huge fire on a construction site in San Francisco left people with a lot of questions, some of which were circulating on Twitter as the fire was still burning. The six-story, eighty foot tall uncompleted structure burned out of control for several hours as nearly 150 firefighters fought to contain the flames and keep the fire from spreading to occupied buildings nearby. The apartment building across the street faced heat so intense, 30 windows facing the blaze cracked from the heat. Many people were surprised that a 180 unit apartment building would be constructed out of wood. This is actually the most common way to build apartments in California, in anything but a high rise. As I’ve pointed out before, housing construction costs are very high and wood construction is usually the most economical way to build condos or apartments up to six stories tall. In some cases, with very large buildings, economies of scale will dictate concrete construction with metal stud walls, but in most cases developers choose to build in wood over a concrete “podium,” which is the platform structure the wood building goes on top of. It usually contains parking, retail, common spaces and sometimes additional housing units. In California, wood construction also has the benefit of performing very well in earthquakes. It is lightweight and its resistance to lateral movement (side to side wind or seismic forces) can be easily increased with plywood shear walls. Unreinforced masonry (brick or concrete block) on the other hand is a disaster in earthquakes– those are the buildings that are required to have warning labels next to the front door (you can’t build those buildings any more under current codes, for obvious reasons). The California Building Code (CBC) is based on the International Building Code, which is used all over the United States. It is concerned with prescribing safe methods of designing buildings, and is particularly concerned with safety and accessibility (although there is also a Fire Code that buildings must comply with). There used to be a larger variety of “model codes,” which are codes that the state codes are based upon, but in the late 1990s the various codes were phased out and the IBC was promoted as a national standard. California lagged behind and took longer than the rest of country to decide to adopt it, but the current CBC is based on it with some differences. It is worth pointing out that building construction is also regulated at the local level, for instance San Francisco has its own amendments that are published online. Additionally, there are many other codes that effect construction. The printed versions fill an entire bookshelf or more, covering plumbing, electrical, mechanical, energy use, wildland/urban interface zones, etc. Every building built within a particular jurisdiction has to comply with all of them. So what are the various types of construction that can be used under the building code? Types I and II. Types I and II construction are those types of construction in which the building elements are of noncombustible materials, which means steel or concrete. Type III. Type III construction is that type of construction in which the exterior walls are of noncombustible materials and the interior building elements are of any material permitted by the code. Fire-retardant-treated wood framing is usually used for exterior walls, but traditional brick buildings with wood framing inside are also of this type. Type IV- (Heavy Timber) Type IV exterior walls are of noncombustible materials and the interior building elements are of solid or laminated wood without concealed spaces. This is typical for old mill buildings, it is based upon the concept that once wood building elements are larger than a certain size they will char and not burn all the way through. Large wood beams and columns of this type are made out of laminated pieces of smaller wood today. Type V. Type V construction is that type of construction in which the structural elements, exterior walls and interior walls are of any materials permitted by the code. This is the most common type of construction for residential building in the United States. It is usually wood studs covered with sheathing of plywood and gypsum board (drywall) and finish materials. Type VA is common for larger buildings, which requires 1-hour rated load bearing and exterior walls, and 1 hour rated floors and ceilings. Hour-ratings are based on the amount of type an element can withstand sustained fire. New York City has banned Type V construction in Manhattan, the Bronx, Brooklyn, and some portions of Queens and Staten Island. This article helps to explain how codes have evolved over time. Construction types and compartments can be combined to make up a larger structure. There are area limitations in the code for each construction type and uses that are only allowed in certain types. Fire rated walls must be used to enclose things with higher fire risks, like parking or transformers. The code allows for a ground floor parking garage to be built out of concrete (Type I) with a wood (Type V) building on top of it. This can allow for each portion of the building to be treated as a separate structure. The code allows maximum sizes (areas and heights) for each construction type, and the area get larger as fire resistance goes up (a wood building has to be smaller than a concrete building). Bonus area is given for certain factors. Including sprinklers and having fire department access on all sides of a building are two things that would allow for additional area of a building under the code. This is done to encourage safer buildings. Type V construction is actually very safe, once it is finished. All residential buildings are now required to have sprinklers in new construction in California, even private homes. Large fires are basically unheard of in sprinklered buildings, assuming the system is working. Fire treated walls with drywall on them are very good at stopping the spread of flames. However, when a building is under construction (like we saw yesterday) there is still a big risk of fire until the sprinkler system is installed. There will always be a lag because the building obviously needs to be framed before pipes can be put in. Fire safety is very important on construction sites, and despite all of the construction that has gone on in San Francisco in the past ten years there has been very few fires (the Santana Row fire in San Jose in 2002 comes to mind). 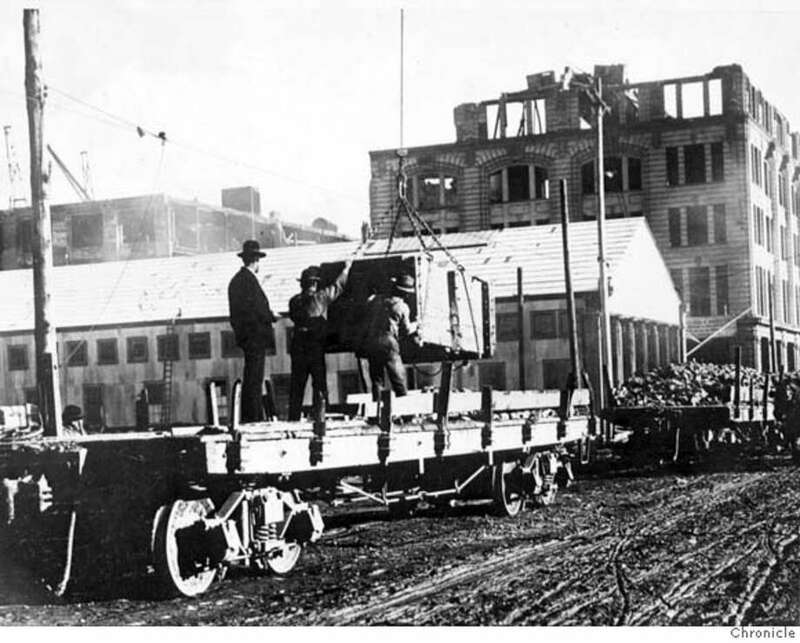 Often, construction site fires are the result of arson, as we saw in Oakland a few years ago. Fire departments are heavily involved in the permitting process and it would be good to get more feedback on how to increase fire safety on construction sites without drastically increasing cost. An innovative new construction type, cross-laminated timber, holds a lot of promise (and that’s something I’ll cover in a future post). Thanks to everyone that came to SPUR yesterday for the forum on housing construction costs, we’ll be having more events at SPUR on this topic including one that looks reducing the costs of providing housing on February 11. KALW radio show about community benefit agreements as they pertain to San Francisco. Interesting ideas about housing from Peter Cohen, including taxing short-term vacation rentals (i.e. AirBNB) like hotels. Is there anything Bill deBlasio can do to make NYC affordable again? Manhattanization revisited from the SFBG. Not much original thinking here, and little interest in actually looking for solutions.